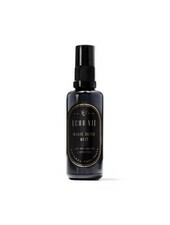 This spiritual spritz is great to use as a body mist or to help freshen up a room. Infused with a Tourmaline Crystal to help protect against life's ups and downs. Ingredients: Alkaline Water, Calendula Tincture (alcohol), Jojoba Oil, Essential Oils of Frankincense, Petitgrain, Ylang Ylang, Lavender, Pinon Pine, Tourmaline Crystal. 4 oz Blue Glass Bottle. Organic/ Handmade.